On an already hot comal or skillet set over medium-low heat, toast the chiles for about 15 seconds per side. The inner skin will turn opaque and the outer skin will crisp. Place them in a medium saucepan, cover with hot water and set over medium-high heat. Let them simmer for 10 to 15 minutes until they rehydrate, soften and plump up. In the jar of a blender, place chiles along with 1 1/2 cups of their soaking liquid, the garlic, oregano and 1/2 teaspoon salt. Puree until completely smooth. In a medium saucepan set over medium-high heat, pour the oil. Once hot, but not smoking, add the guajillo chile sauce and cover with a lid ajar, as the sauce will be jumping. Cook for 3 to 4 minutes, add the chicken broth and cook a couple minutes more. Turn off the heat and keep covered. In a mixing bowl, combine the queso fresco with the chopped onion. Set aside. In a medium saucepan, bring salted water to a rolling boil over medium-high heat. Add the potatoes and cook for 4 to 5 minutes until cooked through but not mushy. Scoop out with a spider or a slotted spoon and place in a bowl. In the same water, add the carrots and cook for 3 to 4 minutes until cooked but still firm. Scoop them out, place in the same bowl and set aside. Once the vegetables have cooled a little bit, add the radishes and lettuce. In a small bowl, mix the vinegar with the oils, 1/4 teaspoon salt, pepper to taste, and a pinch of sugar. Whisk well and pour over the vegetables. When ready to eat, have the guajillo salsa warmed up. Place a comal or skillet over medium-low heat and wait until it is very hot. One by one heat the corn tortillas, about 15 to 20 seconds per side, until they barely begin to toast. With a pair of tongs, dip each tortilla into the guajillo salsa on one side and then the other. The tortilla will barely get “wet” and soften in the sauce. You don’t want to pour this sauce on top, as it is rather bitter, it should just be a light coating. On a plate, set the “wet” tortilla and place 2 to 3 tablespoons of the queso fresco in the middle. Fold the tortilla making a half moon shape. Prepare one by one, or all one after the other, and place on a platter. Garnish with the dressed potatoes, carrots, radishes and lettuce. Place pickled peppers on the side. Por lo general no cocino platillos Mexicanos porque me parecen muy elaborados, pero sus recetas no son complicadas y son deliciosas. Los chiles rellenos fueron un éxito total también. I do the majority of the cooking for my vegetarian family. 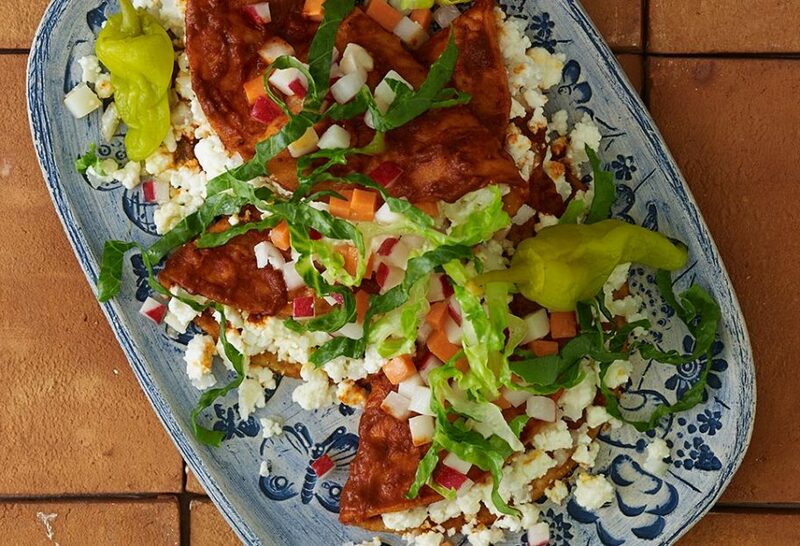 I caught this recipe on TV and never really saw enchiladas like this. They were absolutely delicious and I plan to use the leftover sauce on eggs and tortillas for breakfast tomorrow. Thank you again! Super! And that’s a great use of the leftover sauce…I LOVE eggs. This is a delicious and healthy recipe, very flavorful. The sauce is simple but wonderfully balanced. Now I know what guajillo chiles taste like! Yeah! If you find it too bitter it can be softened with a spoon of tomato sauce. I intend on making a variation with stewed chicken filling and thinly shredded cabbage, raw onion and queso fresco on top to duplicate a long ago favorite, Enchiladas Michoacan served at Austin restaurant, Las Manitas. Not a fan of Tex-Mex as it tends to be bland and one dimensional compared to authentic recipes like this one. It hits all the notes…bitter, tangy, rich, salty, creamy…yum. I served it with heirloom Bolita beans, cooked simply with browned onions, water and salt. So happy you loved the enchiladas and that you will experiment with the recipe, Jan! Hi, Pati, When you made this recipe on your show you didn’t add chicken stock, the recipe on the website includes chicken stock and it’s a lot thinner – what’s the best way to make it? I’m letting it reduce a bit now – hoping it will get a bit thicker. Thank you! love your recipes and your show! I sometimes edit my recipes after the show to make them even better…I recommend you follow the recipe on the website. ¡Saludos desde la Cd. de N.Y.! Super! So glad you loved these Roger. Hola, Pati. Muchas gracias por esta receta. It’s almost like the one my mother’s family still makes. Where can I buy an autographed copy of your cookbook that contains this recipe? I watch your show every Saturday on PBS and enjoy your travels. Muchas gracias por todo. I’m so glad that you like the recipe! Email me at hola@patijinich.com and I can send you an autographed bookplate for my cookbook. Hola Pati, soy padre de familia y cada fin de semana yo cocino para ellos, desde que vi tu programa en TV empece a utilizar tus recetas ya que en la forma que las explicas están fáciles de entender. Lo que más disfruto es cuando mi familia expresa en su rostro que disfrutan la comida que les preparo. Hoy enchiladas mineras. Saludos desde Tijuana. Mil gracias por tomarte el tiempo de escribirme este mensaje, Israel! I just bought all the ingredients and I’m so excited to make these enchiladas for my brother and sister in law this weekend! Love your show, travels, family and warm personality! Thank you for showing all of us a different side of Mexico. I hope everyone enjoys them this weekend! I saw your show this morning and I made this recipe tonight. Ok, so it was more work than I thought (you make it look so easy, haha), but it was delicious, and fresh and very unique. Thank you for always inspiring me to try something new! I’m so happy you were inspired to try something new!!! My sauce came out bitter how can I salvage it? Vida, try diluting the sauce with some chicken broth and cook it a bit further. 76015. Richard Filkins. Thank you, Pati, “pretty face” !!! I’m going to send a signed bookplate for when you get the cookbook! Hi Pati, first I wanna tell you that I watch your TV show all the time it’s on. I want to try your enchiladas recipe, they look so good and I can’t wait to cook them. I have a recipe from a friend in Chicago and I usually cook her’s but I can’t wait to cook your’s. I am eventually going to get your cookbook. Thanks so much for your show and by the way, I think you are so pretty ! I wish I could find someone like you and someone who is close as pretty as you are. Keep on cooking and I can’t wait to try some of your recipes Richard from Texas. I hope you love the enchiladas Richard! Pati, my late grandmother was from Guanajuato. When I saw the episode that replayed this evening I realized I’m going to have to put the city on my travel bucket list. Thank you! Loved the episode. This warms my heart! Thank you for writing to me! Can this enchilada sauce be canned? I caught your show. I enjoy the way you describe your dishes. You thoroughly explain the flavors. That helps us recreate them. I live in San Antonio,Texas. I was raised on the border of Laredo and Nuevo Laredo. We had a lady from Mexico that cooked for our home. Watching you brings back memories of when I watched her cook. Keep up the great work. Love you and your food choices. Thank you, Stephen!!! So happy you love the show! Me encanta tu programa, la manera en que describes los olores y sabores de tus platillos es genial. Por primera vez en US que veo la receta tradicional de salsa para enchiladas, y no como usualmente la que preparan aquí con Salsa del “Cuac”. En una visita a Guanajuato recuerdo haber leído en la carta de un restaurante este platillo, solo que te lo presentaban de dos maneras; Enchiladas de Minero Pobre o Enchiladas de Minero Rico. La diferencia era que el de Minero Rico venía acompañado con Pollo. Gracias por mostrar esa parte tan maravillosa de nuestro México al resto del Mundo. Gracias por compartir, Ana, no lo habia escuchado antes! Hi, Pati I watched your show one time and I really like your recipes, I’m from Mexico but always like new ideas to cook for my family. Good to hear Gloria, hope you can catch more of my episodes!